Batman's car is better than your car. I don't know what your car is—or even if you have one—but I'm willing to bet it can't grapple down a wall before launching you into a super punch against some anonymous goon. This trailer is a small section of Arkham Knight's Ace Chemicals Infiltration mission. I'm not sure "infiltrate" is a verb applicable to ripping down walls with a loud, angular car, but it's a nice looking sequence nonetheless. 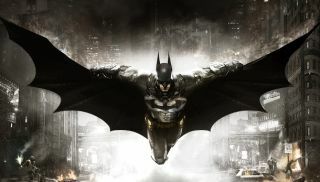 Arkham Knight is due out 2 June.